April 24, 2013, Washington, DC: Washington tour guide Canden Schwantes is living proof that Capitol Hill is not all senators, congressman and politicos. She may spend her days telling stories of great American history on the National Mall, but at the end of the day, she returns home to a neighborhood on the northeast side of the city where the narrative is very much happening in the present day. 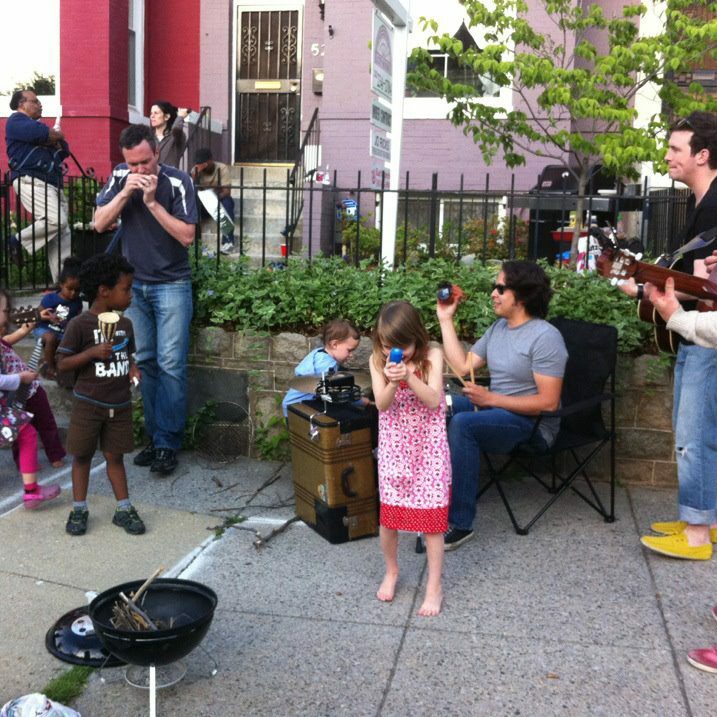 It's a place where grills and guitars are dragged out onto the sidewalk for impromptu block parties, where children publish their poetry and adults make music. Canden is at home among many creative types who live just off the H Street corridor of Capitol Hill; in addition to being a tour guide, she's also a writer whose first book, "Wicked Georgetown: Scoundrels, Sinner and Spies" is due out next month. I first heard about her when I learned of Literary Hill BookFest, a neighborhood festival coming up May 5th at Eastern Market, where Canden will be debuting her work. Right away, I thought the local authors featured at the festival might make for good additions to Neighborhood Nomads -- not only because they're my neighbors, but because they're people who know a thing or two about the role a strong setting can play in telling a good story. Canden and I hopped on our bicycles and met at Jacob's Coffee on 8th Ave. NE to discuss the city. "I like this little place," Canden told me when we arrived. "It's very quiet except on weekend mornings. It's close for me to get to and there's a good set of regulars. You come the same place at the same time, you start to get to know everybody. This is where I wrote the book." The book, it turns out, is about a different corner of the city entirely, and most of its stories are set in a different time. But for a history buff who also volunteers at the the Historical Society of Washington, DC, Georgetown proved to be a setting rife with material. To uncover its tales, Canden spent months searching for stories in the nearby Library of Congress' digital newspaper collection and collecting information from fellow historians. "I'd tell people I was writing a book about Georgetown and they'd started spitting out stories," she said. "It's really kind of incestuous, the same characters... Georgetown was a small town back then and they all wrote about it in their diaries." "There are so many hidden stories," she added. "Georgetown has a stereotype today of being very elite, very high class and that's definitely not how it was for its entire history. It's neat to see the ups and downs. It had its points where the buildings were falling in and everyone was moving out... As an historian, I love that it had its downs." She also admittedly loved having the opportunity to take a playful jab at her fellow tour guides partial to living on the west side of the city while she lives on the east. "We have this little east/west rivalry going on," Canden said. "I thought it would be fun to bring northwest DC down a peg and bring out the scandal. It was fun to delve into the darker side." "I love Georgetown," she conceded. "I don't want to live there -- but I loved it in the 1800s, I guess." Indeed, stuck in the present day, Canden prefers her own neighborhood on Capitol Hill. She enjoys that the H Street corridor is full of great food, that the neighborhood is walkable and bikeable for someone who hates to drive, that her neighbors tend to congregate in their front yards and share keys to each other's homes. And when she tells me she lives "in the poem house", I know exactly where she means. "There's a poem in our front yard," she said. "Last week, a 7-year-old wrote a recipe on how to make pies. It's just a post that has a box with a piece of glass, and we change the poem. Everyone stops to read what's out there and it's fun to just sit out and chat. We know pretty much know everyone on the street. My partner gives drum lessons to almost all the kids. If he doesn't give drum lessons, our upstairs neighbor gives guitar lessons. We're a very musical neighborhood." Canden and her partner happened to land here a little over a year ago simply because it was close to a job. But as luck would have it, the area was just as tight-knit as the one she grew up in in Durham, North Carolina, dashed with a fortunate coincidence. "The Queen Vic opened two days after we moved in," she explained. "We like to think it was fate. We met in England, we moved here, and a British pub opened up. We're there all the time. I actually don't like British food, but I love the people in there." "And here's what I do at Granville's," she added, continuing to rave about the neighborhood restaurants. "I ask them right when I sit down to put a slice of oatmeal pie aside for me 'cause if it's gone by the time I get to dessert, I'll be mad... Whenever tourists ask me where to eat, I send them to Barracks Row or H St."
Beyond the food, it's the architecture of East Capitol Street, the history of places like Lincoln Park, and the family feel of the neighborhood that compels Canden to stick around. "There's a cute little playground called Lovejoy and I like to hang out there," she said. "I like to watch the kids play; I babysit a lot of them. There's a cherry blossom tree and a magnolia tree, so it's aesthetically pleasing. It's nice to see a little bit of green space." Whether she'll live here forever remains to be seen. Canden is quite certain she'll be priced out of the neighborhood when the time comes to consider buying rather than renting a home. And she could end up just about anywhere, considering she's a nomad who's already lived in neighborhoods as far-flung as the London neighborhood called Lee ("If you talk to people from London, they consider it very dodgy"), the Seoul neighborhood called Bundang ("Bundang's a lot like Capitol Hill -- it's a very affluent part of the city, so there's a lot of government officials and a lot of moms very involved in the neighborhood"), and London's better-known Chelsea ("Hugh Grant lived in my neighborhood") before the DC neighborhoods of Bloomingdale and Capitol Hill ("We moved to Bloomingdale because a really good childhood friend lived there and I wanted to be able to walk to his house and not wait for a midnight bus"). To be honest, she's not even sure she'd stick to urban living -- or to this era, if given the choice. "I love the city and I love the country and I love the suburbs," she said. "Ideally, I'd want to live in a Civil War-era Main Street town that has an awesome plantation -- but also has a Metro stop." Learn more about Literary Hill BookFest or click here to order The History Press' Wicked Georgetown.